Baking and Mistaking: Cheating is worth it! These were soo good, and so simple...because I cheated the whole way through! 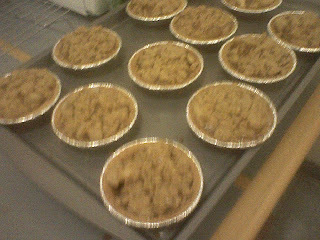 These are individual apple pies I made for a dinner I attended - 18 mini pies! - and they were a big hit, I served them with a scoop of vanilla ice cream - delicious! Anyway, while everybody loved this dessert, nobody knew how little of it I made from scratch. I baked these little pies in store bought graham cracker crusts, these were Keebler brand. I saw them in the store and they were only about $2 for 6 crusts so I had to buy them for some future dessert idea. Well that time came! The instructions say to brush the crusts with some beaten egg yolk and bake for five minutes before filling. I did this, but I'm not quite sure if it made much difference. However the night that I baked these, I was a little bit in a rush and didn't quite have the time to make the filling from scratch....so I used apple pie filling. Don't throw rocks at me, we all have our weak days! Anyway, the pie filling worked great, I divided 2 cans of it among the 18 shells. Then, I made a quick crumble topping out of 3/4 cup of dark brown sugar, 3/4 cup flour and 1/3 cup of butter, mixed together by hand and sprinkled on top of the pies. I baked them on 350 for about 35 to 40 minutes. They looked great, tasted great, and were so simple to make! Tip of the Day: Crumb toppings are simple to make with a quick pulse in your food processor, but work just as well well crumbled together by hand. slash i love you. and i remember these. i wanted one. badly.